Identify the four types of quality costs and explain how they interact (Classification). A product that meets or exceeds its design specifications and is free of defects that mar its appearance or degrade its performance is said to have high quality of conformance. Note that if an economy car is free of defects, it can have a quality of conformance that is just as high as defect-free luxury car. The purchasers of economy cars cannot expect their cars to be as opulently as luxury cars, but they can and do expect to be free of defects. Preventing, detecting and dealing with defects cause costs that are called quality costs or costs of quality. The use of the term “quality cost” is confusing to some people. It does not refer to costs such as using a higher grade leather to make a wallet or using 14K gold instead of gold plating in jewelry. Instead the term quality cost refers to all of the costs that are incurred to prevent defects or that result from defects in products. Quality costs can be broken down into four broad groups. These four groups are also termed as four (4) types of quality costs. Two of these groups are known as prevention costs and appraisal costs. These are incurred in an effort to keep defective products from falling into the hands of customers. The other two groups of costs are known as internal failure costs and external failure costs. 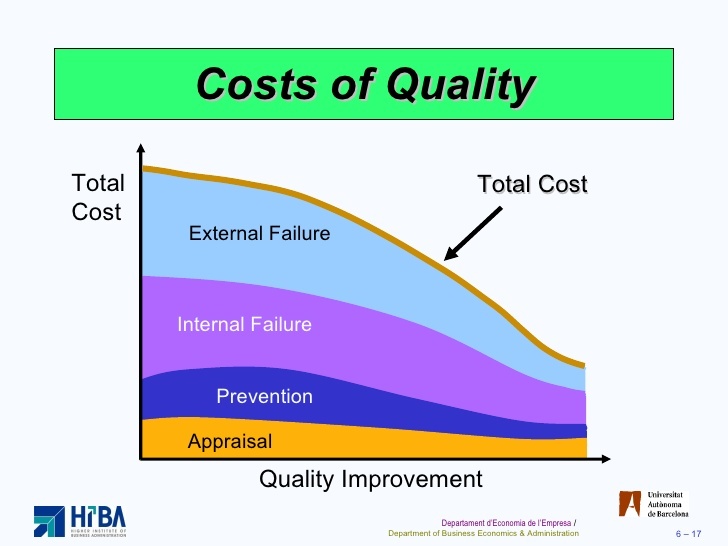 Internal and external failure costs are incurred because defects are produced despite efforts to prevent them therefore these costs are also known as costs of poor quality. The quality costs do not just relate to just manufacturing; rather, they relate to all the activities in a company from initial research and development (R & D) through customer service. Total quality cost can be quite high unless management gives this area special attention. Generally the most effective way to manage quality costs is to avoid having defects in the first place. It is much less costly to prevent a problem from ever happening than it is to find and correct the problem after it has occurred. Prevention costs support activities whose purpose is to reduce the number of defects. Companies employ many techniques to prevent defects for example statistical process control, quality engineering, training, and a variety of tools from total quality management (TQM). Prevention costs include activities relating to quality circles and statistical process control. Quality circles consist of small groups of employees that meet on a regular basis to discuss ways to improve quality. Both management and workers are included in these circles. Statistical process control is a technique that is used to detect whether a process is in or out of control. An out of control process results in defective units and may be caused by a miscalibrated machine or some other factor. In statistical process control, workers use charts to monitor the quality of units that pass through their workstations. With these charts, workers can quickly spot processes that are out of control and that are creating defects. Problems can be immediately corrected and further defects prevented rather than waiting for an inspector to catch the defect later. Some companies provide technical support to their suppliers as a way of preventing defects. Particularly in just in time (JIT) systems, such support to suppliers is vital. In a JIT system, parts are delivered from suppliers just in time and in just the correct quantity to fill customer orders. There are no stockpiles of parts. If a defective part is received from a supplier, the part cannot be used and the order for the ultimate customer cannot be filled in time. Hence every part received from suppliers must be free from defects. Consequently, companies that use just in time (JIT) often require that their supplier use sophisticated quality control programs such as statistical process control and that their suppliers certify that they will deliver parts and materials that are free of defects. Any defective parts and products should be caught as early as possible in the production process. Appraisal costs, which are sometimes called inspection costs, are incurred to identify defective products before the products are shipped to customers. Unfortunately performing appraisal activates doesn’t keep defects from happening again and most managers realize now that maintaining an army of inspectors is a costly and ineffective approach to quality control. Employees are increasingly being asked to be responsible for their own quality control. This approach along with designing products to be easy to manufacture properly, allows quality to be built into products rather than relying on inspections to get the defects out. Failure costs are incurred when a product fails to conform to its design specifications. Failure costs can be either internal or external. Internal failure costs result from identification of defects before they are shipped to customers. These costs include scrap, rejected products, reworking of defective units, and downtime caused by quality problem. The more effective a company’s appraisal activities the greater the chance of catching defects internally and the greater the level of internal failure costs. This is the price that is paid to avoid incurring external failure costs, which can be devastating. When a defective product is delivered to customer, external failure cost is the result. External failure costs include warranty, repairs and replacements, product recalls, liability arising from legal actions against a company, and lost sales arising from a reputation for poor quality. Such costs can decimate profits. In the past, some managers have taken the attitude, “Let’s go ahead and ship everything to customers, and we’ll take care of any problems under the warranty.” This attitude generally results in high external failure costs, customer ill will, and declining market share and profits. External failure costs usually give rise to another intangible cost. These intangible costs are hidden costs that involve the company’s image. They can be three or four times greater than tangible costs. Missing a deadline or other quality problems can be intangible costs of quality. Internal failure costs, external failure costs and intangible costs that impair the goodwill of the company occur due to a poor quality so these costs are also known as costs of poor quality by some persons. Lost sales arising from a reputation for poor quality. Very simple and inexpensive procedures can be followed to prevent defects. Yamada Electric Company had a persistent problem assembling a simple push button switch. The switch has two buttons, an on button and an off button, with a small spring under each button. Assembly is very simple. A worker inserts the small spring in the device and then installs the buttons. However the workers some time forget to put in one of the springs. When the customers discover such a defective switch in a shipment from Yamada, an inspector has to be sent to the customer’s plan to check every switch in the shipment. After each such incident, workers are urged to be more careful, and for a while quality improves. But eventually, someone forgets to put in a spring, and Yamada gets into trouble with the customers again. This chronic problem was very embarrassing to Yamada. Shigeo Shingo, an expert on quality control, suggested a very simple solution. A small dish was placed next to the assembly station. At the beginning of each operation, two of the small springs are taken out of a parts box containing hundreds of springs and placed in the dish. The worker then assembles the switch. If a spring remains on the dish after assembling the switch, the worker immediately realizes a spring has been left out, and the switch is reassembled. This simple change in procedures completely eliminated the problem. Source: Shigeo Shingo and Dr. Alan Robinson, editor-in-chief, Modern Approaches to Manufacturing Improvement: The Shingo System, (Cambridge, MA: Productivity Press, 1990), pp. 214-216. Want to learn more about quality cost?